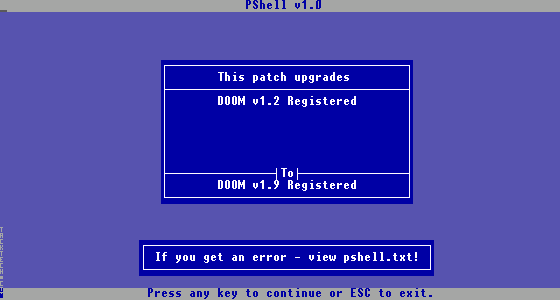 Patching Doom to v1.9 (Registered) (Doom) - TACKtech Corp. This article assumes you have already installed Doom. If you already have Doom v1.9 then you do not need to use this article. Select the patch which applies to your version of Doom. Save the patch to your Doom folder. Type command into the Open textbox. Type the drive letter you installed Doom on followed by a colon. Type CD\ followed by the directory (folder) you installed Doom to. Type the patch name you downloaded. Wait while the patch is applied.